This woven band of multicolor threads is my favorite studio supply. It's perfect for appliqué. It also reminds me of a poem by Rilke. It's Good Friday, the day of Christ's death and burial, so I chanted a little prayer to Jesus while I was stitching today. 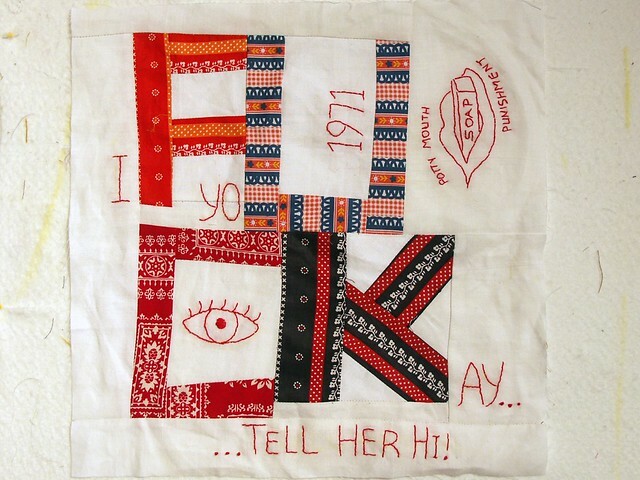 "this is a communal quilt project designed... in an effort to get more quilters/embroiderers/textilefolks to exercise their potty-mouths in textile form." In 1971, I was seven years old. I came home from school one afternoon. My grandparents were visiting and sitting on the couch. My little brother was playing at the other end of the living room. I began taunting him with a saying I had heard at school that day. If you see Kay... tell her hi! I didn't know what it meant, but I thought it must be something cool and clever. Maybe I had the sense that it was taboo in some way. All the other kids were repeating it behind the teachers' backs. F you see Kay... tell her hi! F U see Kay... tell her hi! F. U. C. K... tell her hi! I was unrelenting with my taunt until my four year old brother started to cry. My grandparents overheard. My mother grabbed me by the collar and took me to another room. She made me repeat the nasty saying. My dad took me to the bathroom and scraped a bar of soap against my upper teeth. I wasn't allowed to drink any water. I was sent to my room without dinner... I still didn't understand what I had said but I knew it was bad. The moral of this story... If you choose to exercise your potty-mouth there will be consequences. Good luck Chawne! And thanks for the opportunity to participate. 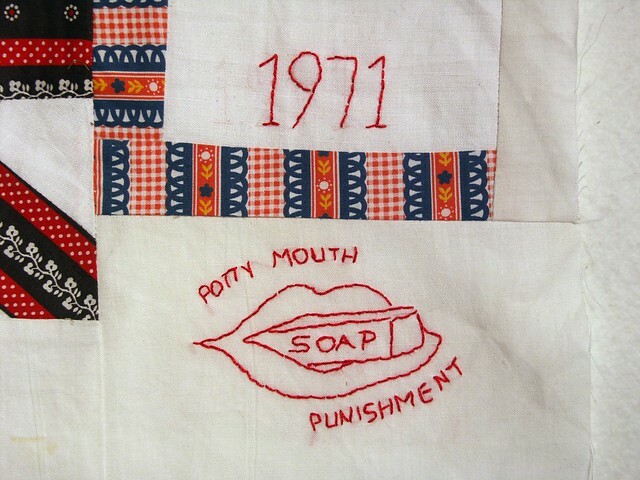 Dear readers, if you have a memory of the first time you exercised your potty-mouth, I would love to hear it! I was thinking of rage and grief... and my desire to be a prophet, to sew banners bearing the names of the dead arranged to declare REPENT! Diagnosed with pancreatic cancer the previous July my mom lived six more months. During that time I moved in with my parents and helped my father with her care. It was an abundant and sacred time, filled with sorrow and joy. During her last days the war in Iraq was in the news every night. 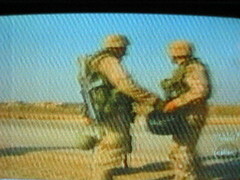 Not yet a year old, the war had claimed the lives of about 230 Americans, and countless Iraqis. I was angry about the war and I was angry about my mother's death. I kept thinking of the families, like mine, who were experiencing the holiday season in mourning. 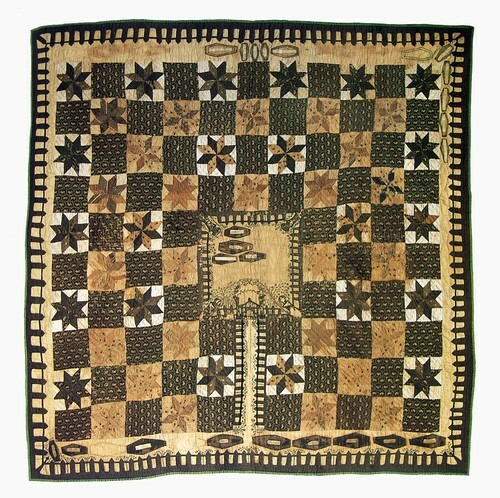 Reminded of the Kentucky Graveyard quilt made in the 1943 by Elizabeth Roseberry Mitchell and her two daughters to mourn the death of her sons, the idea of stitching the names of the dead soldiers onto cloth coffins came to me as a way to convert my rage into compassion, to connect my suffering with the suffering of other families facing the loss of loved ones. I began Prayer Banner: REPENT in January 2004. I consider the act of stitching a name on the coffin as an act of prayer and petition. The posture of embroidery, head bent towards the hands with the heart in between, is an internal, meditative posture. 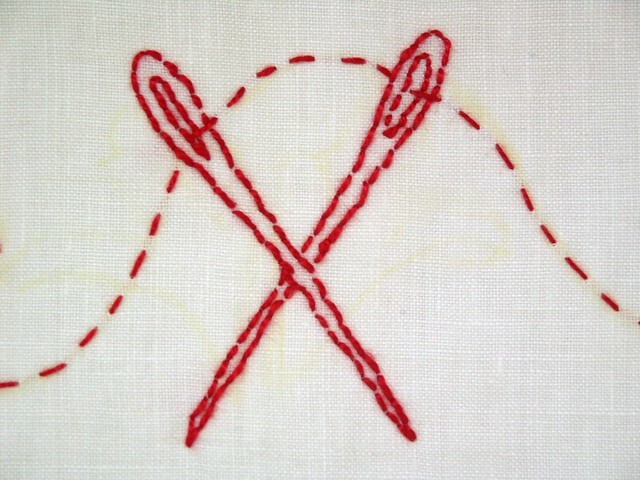 Akin to the Buddhist practice of Tonglen, I experience the stitching as a mediation on letting go. As I sew I breathe in the anger and suffering of the family of the person who's name I am stitching, and breathe out compassion and love for myself and others suffering loss along with me. 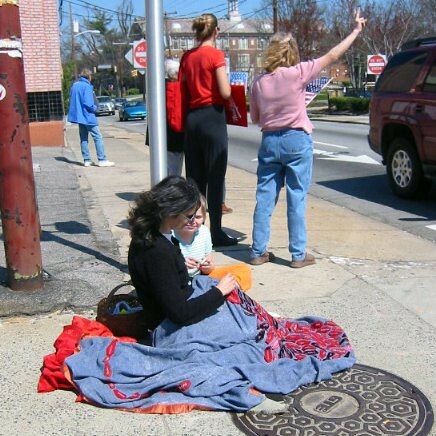 At first I stitched alone but soon I took the Prayer Banners to the streets, churches, schools, museums, galleries, and homes. The purpose of holding public sewing circles, is not so much to memorialize the dead but to provide opportunities for communal bereavement. 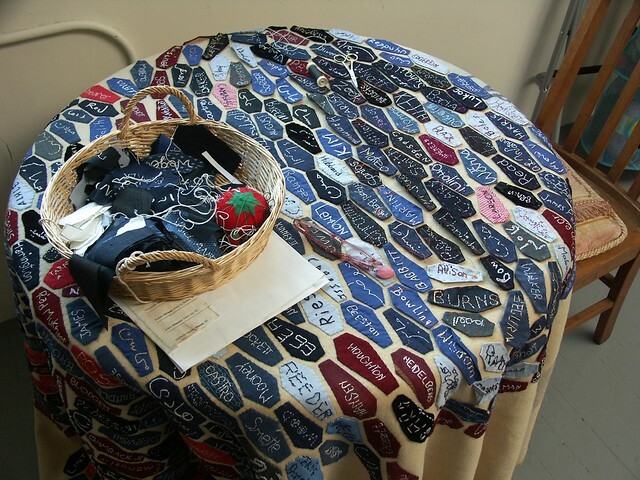 Stitching the name of the dead is a simple activity that allows people to connect to their sense of communal loss and to do this with people in their community that they might not otherwise interact with. Close to 1000 people have stitched on the Prayer Banners. The banners stand as a witness for the dead. The hand stitched coffins are arranged to spell words that speak to the degradation of war and call for change. The first Prayer Banner spells the word REPENT. 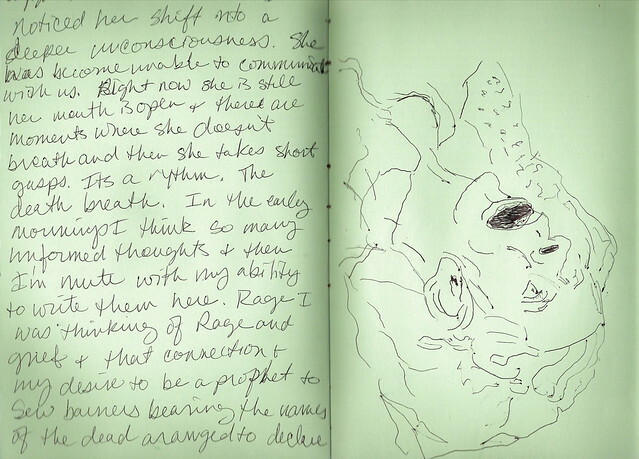 The second in the series spells the word MERCY. The third will spell the word GLORY. Someone once told me that while looking at the Prayer Banners they thought about all of the time it took to stitch the names and of all of the lives lost - the wasted time and wasted lives, lives that should never have been wasted. I HEART REDWORK! I created this banner to invite people to participate in stitching names for the Prayer Banners. Someday, I would like to do something more extensive. 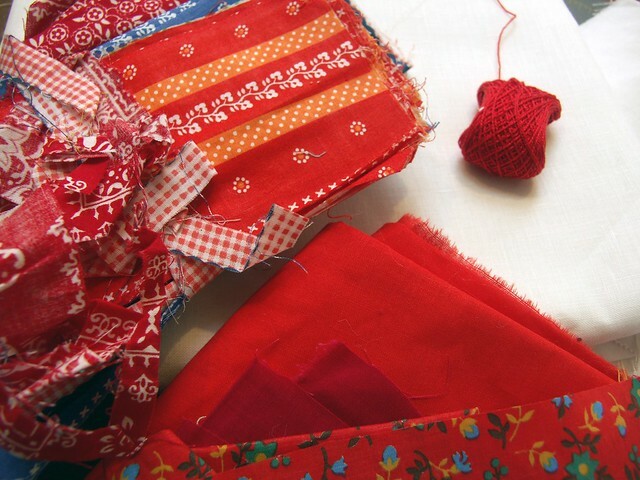 Sheetal shared a link on the Hoopla post, to the redwork quilt below by Nova over at a cuppa and a catch up. It's a collaboration with her mum in the UK. Now this is what I mean about something more extensive! Also check out Cauchy09's bold and beautiful redwork over at flickr. BTW I loved all of your recent comments on embroidery, and congratulations to Molly over at Baily Girl Five for winning the Hoopla Giveaway. Just out ~ Hoopla, the Art of Unexpected Embroidery by Leanne Prain. I am pleased to report that my work is featured in this 400 page book on innovative embroidery. 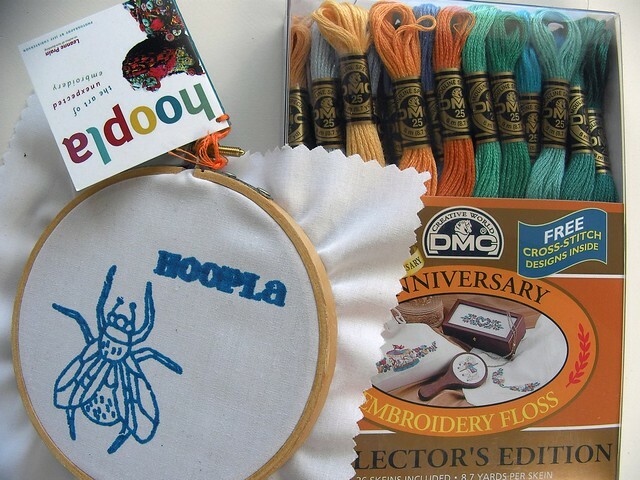 Hoopla contains in depth interviews with artists working in the medium along with fabulous DIY embroidery projects. Hoopla has it all! I'm so honored to be a part of it. 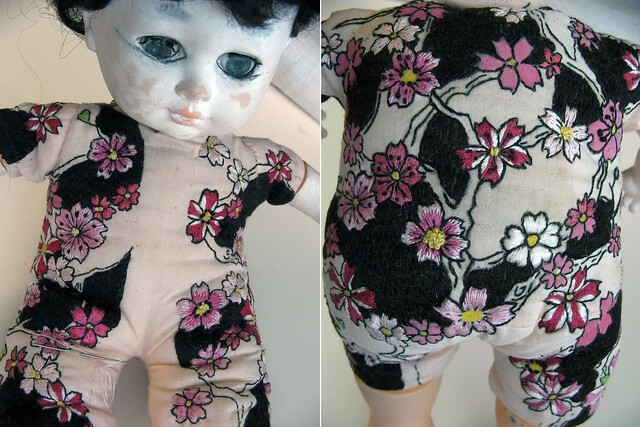 One of my Tattoo Baby Dolls even made the back cover! Last Thursday Leanne was in San Francisco promoting Hoopla at the Museum of Craft and Folk Art during their monthly Etsy craft bar. Lots of craft lovers were on hand to meet Leanne and participate in one of the stitching projects featured in her book, Photo Feelism. Check out Leanne's Hoopla website. It was a lot of fun meeting Leanne. Not only was I lucky enough to be included in Hoopla, I won the night's door prize! Since I already have a large stash of embroidery floss I'm passing my prize along as a giveaway. To enter leave a comment about anything related to the art of embroidery, such as your favorite stitch or the kinds of images you usually embroider. 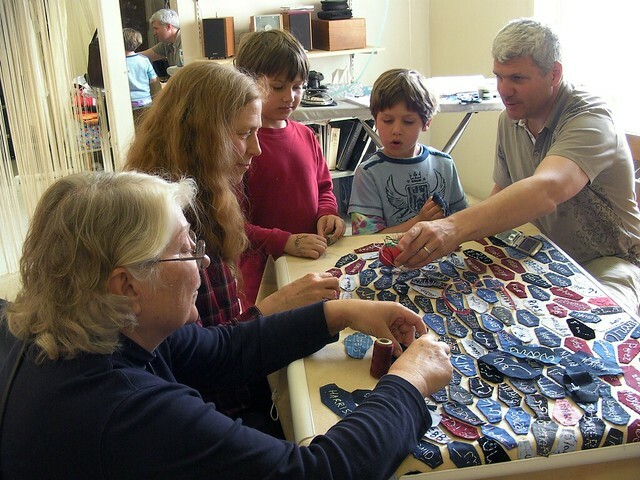 You can describe or link to something you've embroidered recently, or to something you've seen that someone else has embroidered, leave an embroidery tip, tell a story about someone you know who embroiders, or anything about your experience with embroidery. I'll leave comments open for the giveaway through Wednesday, October 19. 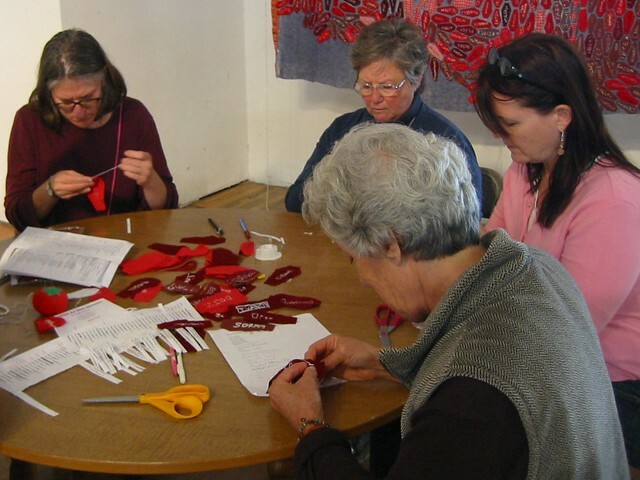 Fourteen women helped stitch names of fallen American soldiers and Iraqi citizens for the war memorial and bereavement project Prayer Banner: MERCY as part of the Veteran's Day Virtual Sewing Circle. Nicole in Memphis, TN Names of the Fallen on Turn Your Face To The Sun. Heather in British Columbia, Canada Mercy And Security on True Stitches. Lisa in Malvern, PA Every Day Is Veteran's Day on A Thread from the Edge. Lynda in Richmond, CA, stitched names with Lauren & Audrey B. A HUGE thank you to all of the above! Your stitching is marvelous and I can't wait to add your handiwork to Prayer Banner: MERCY. I enjoyed this tremendously and only wish we could all be in the same room stitching hand-to-hand. Even though the war in Iraq is supposedly over, deadly emotional ramifications continue to persist. Join me for a virtual sewing circle in honor of Veteran's Day. 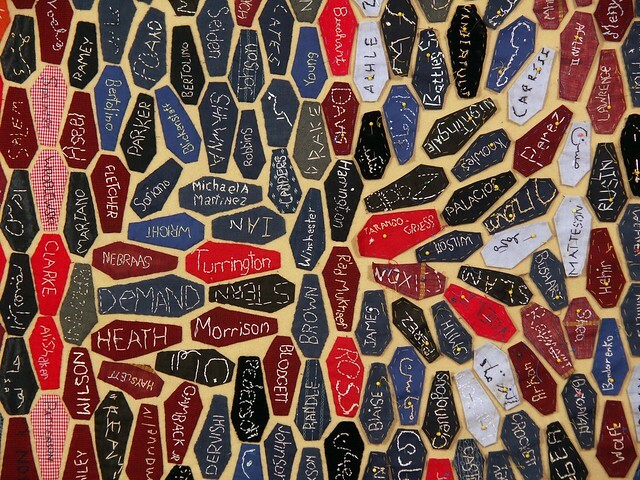 Help stitch the names of soldiers who have died in the Iraq war as a meditative act of petition, prayer and compassion.